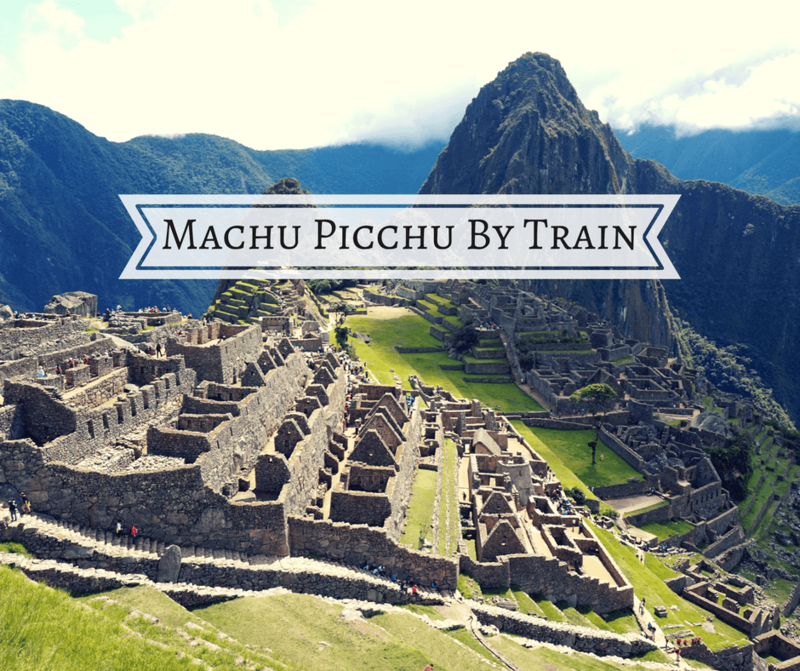 Getting to Machu Picchu can be an adventure in and of itself, but with this guide, we can make traveling to Machu Picchu by train a lot easier. There are a few different ways that you can get to Machu Picchu. Many choose to do the Inca Trail which is a four day hike that covers over 25 miles miles. However, if you have time restraints or you’re a little hesitant about the physical aspects of the hike, we would recommend taking the train. We purchased our tickets through Peru Rail’s website about a month and a half ahead of time. It was a fairly easy process. “Rountrip” should be bubbled, under “Destination” you put Machu Picchu, under “Route” put Cusco, put your travel dates, and how many Adults/Children. The next screen will show you different times and train car options. We chose the Expedition car which was the cheapest, but ended up still being VERY nice. Prices also vary depending on what time you choose. From the center of Cusco (which is most likely where you’ll be staying) the best way to get to the train station, which is actually in the small town of Poroy, is to take a taxi. Your hotel/hostel should be able to arrange a taxi pickup for you. If you need a recommendation for a great hostel in Cusco, click here. It will take about 30 minutes depending on traffic and average cost is about 30 soles ($10). As you’re driving to the train station, you are going to pass parts of the city that aren’t touristy and not well kept. It’s ok; it’s just like any other city! The train station itself is very nice though. If you’ve already printed out your tickets online then you don’t need to go to the Ticketing Office and can go straight inside. To your left you’ll find comfy seats and a cafe that serves coffee and small treats like empanadas (yum!). To your right you’ll find rows of benches. Find a seat and relax because it fills up quickly! Boarding was very much like boarding a plane and was very organized. We were very pleasantly surprised once we were inside and took our seats. We were grouped in fours with a table in between us, there were panoramic windows that let us have unobstructed views of the mountains, it was air conditioned, and there was Andean music playing softly in the background. We left from Cusco and arrived in Aguas Calientes, the town at the base of the mountain, in about three and a half hours. We were provided with drinks and some snacks during the ride and of course the views along the way were pretty great. We saw small towns, farms, rivers, canyons, and lush mountains. Once you’re in Aguas Calientes everything is within walking distance. There isn’t much to do either, so I would recommend dropping off your bags at your hotel/hostel, getting something to eat, and relaxing the rest of the day because you’re going to need your energy for the following day. Also, if you still have to get your bus ticket to get to the top of the mountain you can do so in the center of town. The buses start operating at 5:30am. Everyone told us to get in to Machu Picchu as early as possible to avoid the crowds and the heat so we planned on being on the first bus. We got there at 4:45am thinking we were going to be first in line. Ha! Little did we know that people had been lining up since 4am! But it didn’t make a huge difference; they had plenty of buses ready. We ended up leaving at 5:45am on the 5th bus and were at the top of the mountain just after 6am. There are pros and cons to getting to Machu Picchu so early. When we got there, the clouds and mist were so thick, you couldn’t see anything. I mean, nothing! But the good thing about that is that you can observe how magical it is to see the clouds lift. You just have to have patience. And the whole “It gets crowded” issue didn’t seem too bad. We were there til about 1pm and although the amount of people had significantly increased, at no point were we bumping elbows with anyone. At no point are you going to get that perfect shot with no one in it, so don’t stress about the crowds. If you want to sleep in and take a later bus, I don’t think it’s that big of a deal. They run every 10 minutes. We had decided beforehand to take the train back to Cusco the same afternoon that we explored Machu Picchu. Since we were done at the ruins at about 1pm, we took the bus back down into Aguas Calientes. The buses run continuously so you can head back into Aguas Calientes easily when you’re done exploring Machu Picchu. Once we were back in Aguas Calientes, we just relaxed in the lobby of our hostel until we had to walk over to the train station at 4:30pm. Like I said, there really isn’t much to do in Aguas Calientes, so there’s no point in staying an extra night. Boarding went smoothly once again and this time we slept most of the 3.5 hours. Good thing the seats are so comfy! Great photos. I want to do this with my family. Thanks for the info. Just the post i needed …Machu Pichu is high on the list of places to see…thanks for the inspiration and assistance! Thanks Vicki, the information is so helpful. There are some places you travel where you really do want to have the detail researched in advance so you know what to expect and can get the maximum out of the relatively short time at the location. Thanks Toni! I hope everyone finds it useful. We also went to MP via train. We did it twice so we can also witness the sunrise, stayed at Aguas Calientes overnight. Hi Tanj! To get to see the sunrise was very lucky! We were there early enough but there were too many clouds. I’m headed to Peru in a few weeks – can’t wait! Never been, but want to go! I love train rides! Thanks for such detailed tips for the ride! Yay! Finally got to see this post after seeing Buddy at Machu Picchu on facebook! We really want to visit Machu Picchu. We will definitely keep these useful tips in mind! Thanks! And there are even more tips coming soon! Useful post! Thanks for the all the info. Looking forward to your upcoming tips. The train looks like fun. The views from the train look amazing. Hope to do this someday. Hi Jennifer! If you ever have any questions, feel free to email me! Thanks for sharing! Peru is high on our bucket list so this will definitely come in handy when we get round to going. Peru is pretty high on my wish list at the moment. It’s good to know the train journey is an enjoyable alternative to the trek which I doubt we’d attempt with young kids in tow. It’s definitely a great option! Hi i am heading to South America in 15 months, to backpack (slowly). Just wondering what the train ticket cost. Was this the tourist train or the local train. I have heard there are 2? Hi Tammy! The train was mostly tourists. I don’t really know anything about the local train. And the cost depends on the train car you want to ride in. For example, we booked tickets on the Expedition car which was the cheapest. It averages at about $70 per person each way. Hope this helps! !